Oluv's Gadgets: First impressions - Fugoo Bluetooth speaker! First impressions - Fugoo Bluetooth speaker! I just received the Fugoo speaker yesterday so my own review will be coming up soon. Unfortunately it is going to be in German this time, sorry folks, but there are already some great and detailed reviews of the Fugoo in English, like that from Gadgetmac, Mashable by Brent Butterworth, Tom's Guide etc. but Fugoo is currently starting to offer their speaker in Germany for the first time, though any German review is still missing, so I will hopefully be the first one to close this gap! As you can see my son is already pretty excited about this new toy. He even managed to drop it once, but there is no need to become worried, as the speaker is extremly rugged and well protected inside the "Sport"-jacket. I also received a "Tough"-jacket which looks like a tank. Of course I will test this too, although I am a bit afraid of my floor getting damaged if my son manages to drop it again inside this one. My first impressions are very positive indeed. Although I immediately became annoyed by the much too loud voice-prompts, you can deactivate them completely with some button presses. There are lots of different combinations to enable different modes, you probably have to learn them by heart, but the Fugoo can do lots of things, the limiting fact is that it has only 3 main buttons and the power-button, so look forward to some finger-acrobatics. The sound is pretty smooth. It is by far not as heavy as on the Bose Soundlink Mini, but the Fugoo sounds more natural with very clear mids and perfectly tuned treble. There is plenty of bass, reaching quite deep, it is not as boosted as on the Bose, but the Fugoo nevertheless never sounds anemic. 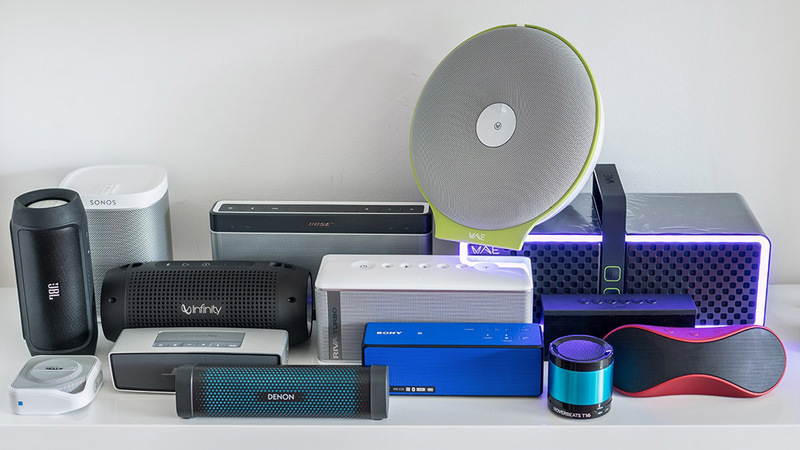 You really get a sense of punch and there is "real" bass, unlike most other portable speakers I have tried, including the JBL Charge, UE Boom etc. I think the Fugoo can compete pretty well with bigger speakers as well, becaues when I directly switched between the Fugoo and the Soundblaster Roar, I preferred the much more open and less boomy sound of the Fugoo, without that much upper bass, but with more low bass instead compared to the Roar. As the Fugoo is nearly omnidirectional you don't need to care about placing or aiming it at you. 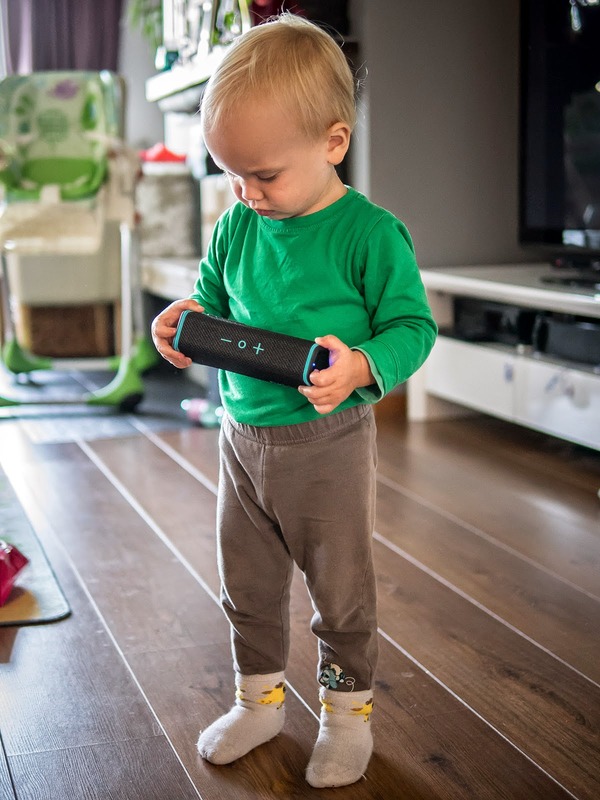 It sounds just good, wherever you put it, even on the floor from above it sounds gerat, regardless if you are listening from behind or from the front, as it has all drivers spread to all sides. Volume control is synced with the player, which is great because you can also control start/stop and track skipping directly from the speaker, if you intend to use it mounted on your bike with your phone hidden somewhere in your pocket for example. The only thing I noticed is that maximum volume might be a bit low for some. Currently it is by far not as loud as the Bose Soundlink Mini for example, but I still have an older Firmware (01.00.14) installed, so I will hopefully be able to compare it with the latest 01.00.46 firmware which is claimed to improve sound quality and overall loudness! I will try to prepare some comparison videos as well as detailed frequency response measurements. Of course there will be also a comparison to the Soundlink Mini, and maybe the UE Boom, but after having listened to to the Fugoo for some minutes only, I can already claim by now that the Fugoo is just a class above the UE Boom with a much more mature sound, while the UE Boom can play considerably louder, but just sounds like a tin-can speaker, not a grown up system! Please be patient and give me some time to prepare everything! Sehr schade, dass Du mit Deinem Test die Hardware-Unzulänglichkeiten des "Eva Blue" bestätigt hast von denen auch in anderen Tests berichtet wurde. Wenn das Gerät zuverlässiger wäre dann hätte ich mich dafür wohl begeistern können. Aber knapp vor den klanglichen Qualitäten kommt halt immer noch eine zuverlässige Bedienung. Stimmt die nicht, dann ist das leider ein absolutes No-Go. I saw your video review for Fugoo and Bose. What's your take on Fugoo against X3? Really love the blog. I bought soundlink mini lately as it seams with best sound and your research has been also helpfull. I am not dissapointed. But still look around other products. And sometimes I think it would be nice to have conference option and charging option in bose. Lately i found pioneer freeme speaker that seems promising. Will see. This bluetooth speaker looks good, thank you for your detailed introduction. Infinity One - the better Pill XL? JBL Charge 2 out now!